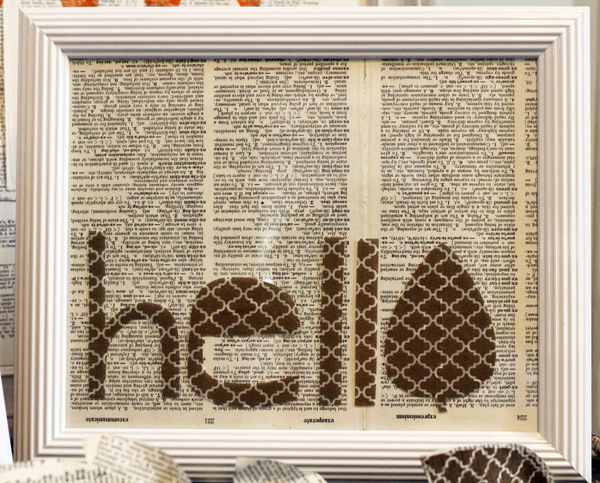 things that shine: hop along with Scrapbook Steals! and a chance to win! hop along with Scrapbook Steals! and a chance to win! Contest is closed -- thanks for playing along! 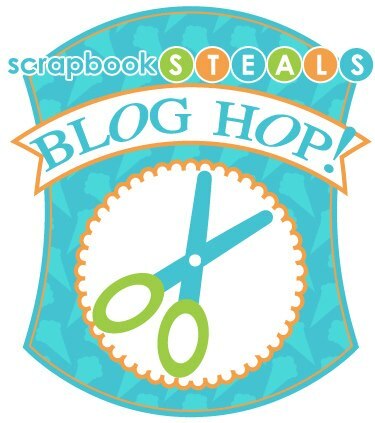 Come and hop along with us for a blog hop with Scrapbook Steals! I think you will find some awesome scrapbooking ideas along the way! Don't forget to leave a comment for your chance to win a 20$ gift code to ScrapbookSteals.com! I used orange and brown WRMK washi paper to make a autumn decor set. Three frames, an embellished pumpkin, and a garland. I started this set by making a cute little acorn piece in a white frame. I freehand cut the acorn bottom from brown quatrefoil washi paper, and then cut the top from the orange fan washi paper. I applied the washi shapes directly to the front glass in the frame, and slipped an old book page in behind the glass to create a simple, neutral background. I love this piece! It was so simple and so easy to make, and added such a fun bit of autumnal colour and imagery to our house. And, when the season is over I can just peel the washi pieces off of the front of the frame and can re-use the frame for another project. Maybe a tree, star, or snowflake for the winter holiday season? I wanted a simple greeting to fit inside a second white frame, because I planned on putting these fall decor pieces near my front door. And what is more friendly than saying hello? 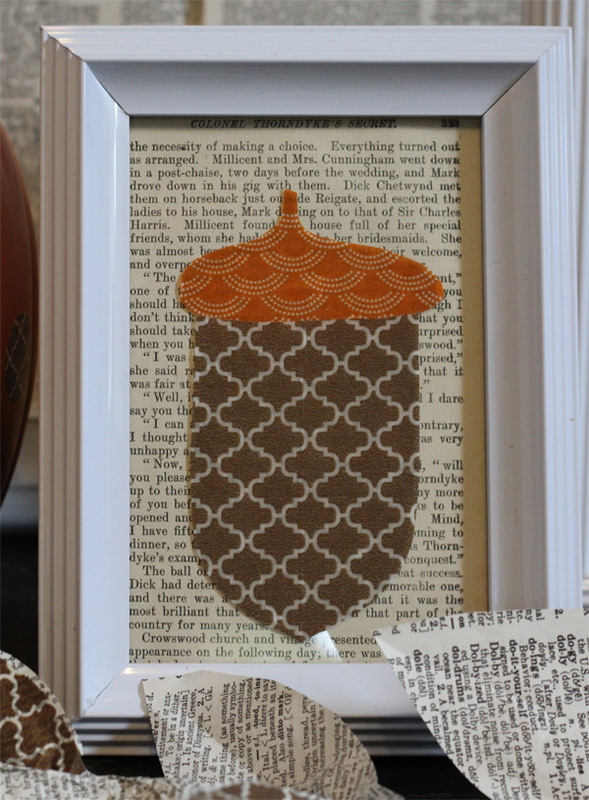 Like the acorn frame, the washi pieces are applied to the front of the glass, and the book pages behind. So this frame too can be easily reused for another project! I can totally see keeping a small stash of washi paper on hand and just swapping out the phrases and imagery for all of the seasons and holidays over the upcoming year! To keep this feeling like fall, I used a flat leaf as the O in the word hello. I freehand cut the letters and leaf from the washi paper. I first figured out how tall I wanted the letters to be, and then cut a strip of washi paper to that height, and trimmed it to the length of the frame. Then when I freehand cut out the letters, I knew they would all be the same height and fit in the frame. No measuring, ruled lines, or needing to re-cut and try again! Pumpkins don't just have to be for Hallowe'en! I turned this leftover faux Halloween pumpkin into a pretty fall pumpkin by punching out washi paper polka dots and applying directly to the surface. Super easy, and super cute! 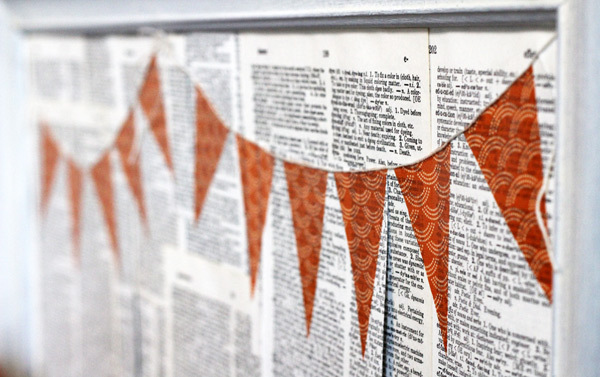 I topped the pumpkin with a dictionary page bow so it would co-ordinate with the frames in the set. If I want to use this pumpkin again next year for Halloween, I can easily remove the washi paper polka dots. How cute would this be decorated with washi tape letters that say boo, or maybe a cat, cut from black washi paper? This large frame originally had a really ugly print of some ducks in it. I just papered right over those ugly ducks with dictionary pages, and painted the frame white. I cut pennants from orange washi paper and applied them directly to the paper, this time. I think this would be super cute in a little boy's room... or a little girl's room! 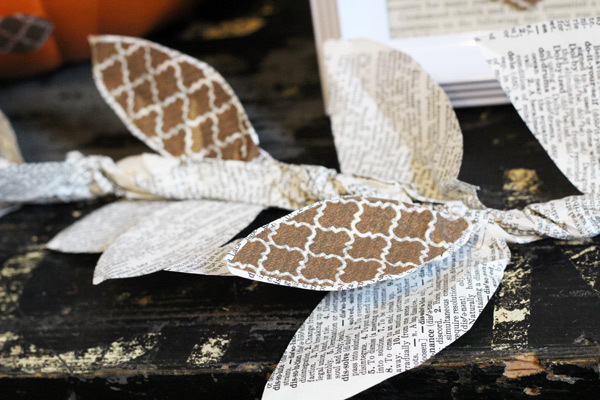 This paper garland was made from dictionary pages twisted into a vine and embellished with paper leaves. I covered some of the leaves with washi paper to add just a touch of colour. I love how the brown washi paper really stands out against those wonderful dictionary pages. This garland looks great laid out on our entry way trunk, and also looks really awesome along the top of our bookshelf! I am also thinking it would be a very cool alternative to a runner on a Thanksgiving table or buffet. Thank you so much for hopping along with Scrapbook Steals and stopping in today! I am really excited about We R Memory Keepers adhesive washi sheets and all of the great project possibilities. I was very impressed at how easy this tape paper is to work with -- it goes on smoothly, sticks well, and best of all, I did not become a tangled up sticky mess! Leave a comment on this blog for your chance to win a 20$ gift code to ScrapbookSteals.com. One winner will be randomly selected from all the comments left on each blog in the blog hop, so be sure you stop by each of the blogs listed above and leave a comment at each one to increase your odds of winning! You have until 11:59MST on Sunday, November 4, to make your comment. Your pumpkin is soooooo cute! Ack! I can't wait to get my washi sheets!!!! Love the fall decor! The polka-dotted pumpkin is my favorite. :) Such versatility from these washi sheets! the decor is great! lots of great ideas and inspiration! cute projects! loving your acorn! thanks for sharing! 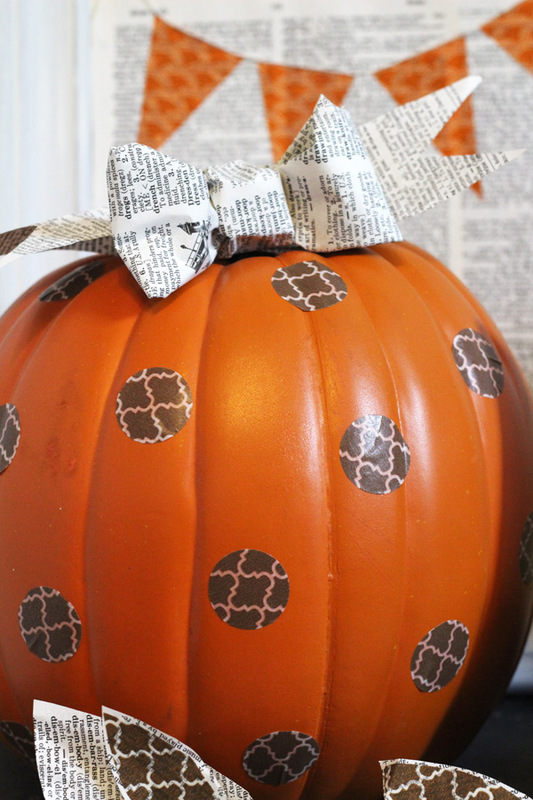 I love how the washi looks against the newsprint and the pumpkin!! Great decor pieces! I really love the frame with teh banner, very cool! Love love love it! The acorn is the best! Wow...this is really creative! Cute projects! Love your projects! That pumpkin is especially adorable. I love these projects! Great work! I love how you used washi tape to decorate your pumpkin! Who-da-thunk?! Very clever! Super adorable projects! They look wonderful together!! Great fall decor! Love that look against the newsprint! Wonderful ideas!! The decor projects are wonderful. I love that dotted pumpkin. Love all your cute frames! Great job! love what you've done with your washbi sheets! These are wonderful projects! I love all of the fall decorations. LOVE that pumpkin!!! Such a fun way to decorate it!!! And beautiful fall art!!! Thanks for the wonderful inspiration!!! It is sooo fun to create home decor projects! What great Fall home decor projects. I could never cut an acorn freehand and have it look like that! banners are a great idea! SOOOO stinkin' cute! I must make a pumpkin like that next year! I always love banners. Great ideas. I have so much inspiration after my blog hopping. Thank you for sharing! My goodness.... I love the decor and pumpkin! You are so creative! Love all your fall home decor projects! Thanks for sharing your ideas! Oh, I do love washi tape, and now I can see all the possibilities with the washi sheets! Very cool product from WRMK, and love how you've used them for your projects here! I love your projects!! Just gorgeous! WOW! This is awesome! I love that little bow on the pumpkin hehehehe! And those awesome leaves! Love it all! Thanks! 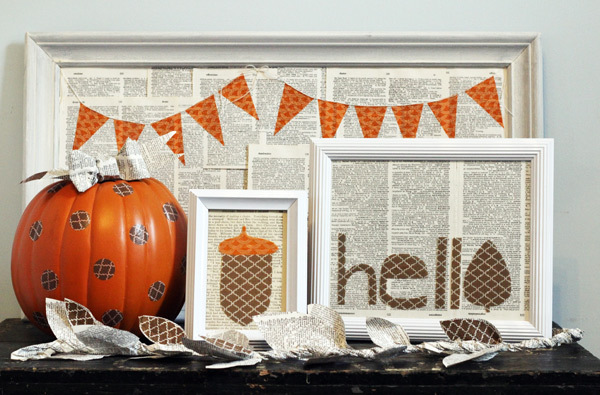 The fall decor projects are a-dor-able! Absolutely love the pumpkin!! Can't wait to try using it!!!! These are wonderful fall projects! Such fun fall projects! Thank you for sharing! The pumpkin is awesome. Such a great idea. Love your fall projects using the washi sheets. Thanks for sharing them with us. Your Halloween projects are beautiful. Thanks for the chance to win. Fun idea for the pumpkin!